So, I wasn\'t gonna even write this post, but my fellow players (formerly 149\'s Beholders Road) insisted that I did. So for this new recharge history event we should have BOTH 149 AND 142 RECHARGE HISTORY COUNT! So u guys better come up with a solution for us. Because for most of us are cheated out of the (reaching 100000 diamonds) exclusive reward and potential exchange for fuse gem in the event shop. BTW. for future events like this take us into consideration. Dear Player, I´ll make report, and when my supervisor is back to work he´ll check it, hopefully we´ll find solution to your problem, thank you for informing us. Have a good day. 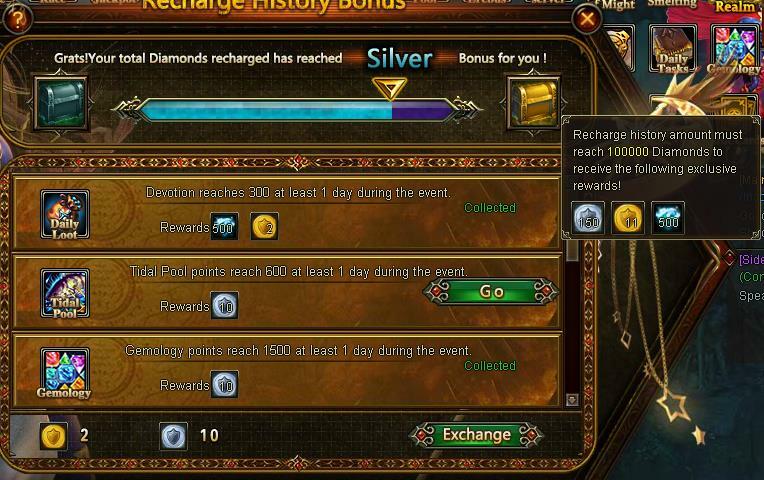 I was a formal S149 myself and think that this recharge history bonus is unfair to us if s149 recharge history is not taken into consideration. Some of us might missed the 100k mark by a few thousands. That few thousands could have been met if all of our recharged from s149 also counted. All of formal S149 should at least get the 100k reward package and not silver and that is just for the recharge history never mind all the troubles and hoops we have to jumped through. I understood your friend explained it to me so I made report. I have included that everyone from S149 should have this checked, so please wait till my supervisor checks the problem with our dev team. Thanks for the fast rely, I just hope it gets resolved in a timely manner. even if they didn\'t recharge 100k? lol no, those who did recharged 100k. I guess is a misunderstanding. 2019-4-27 00:22 GMT+8 , Processed in 0.059157 second(s), 52 queries .